UPDATED! I am building a SECOND expedition trailer! 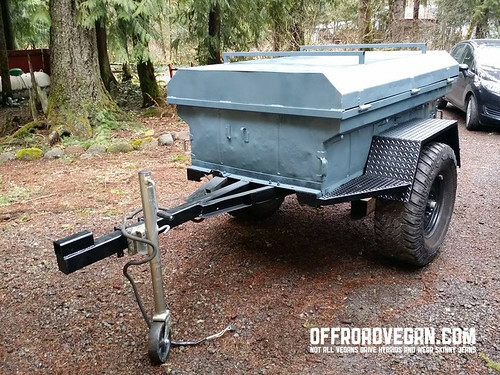 On 4/1/2016 I purchased a 1946 Willy’s M100 trailer from a seller in Livermore, California. While on a recent trip to San Francisco, I happened to open Facebook and saw a unicorn – a 1946 Willy’s M100 for SALE! And the price was right. So I bought a trailer hitch, installed it in a dirty alleyway, and the following morning dragged the trailer all the way to Portland. At this point, plans include better electrical, paint, fab and welding, 37s, and a few extras. Day 1: In Livermore, California. 4/10/2017: My friend is doing the fab work for this phase of the build which includes new fenders, platforms before and after the fenders, extended tongue and tongue deck, fitment of a CJ tailgate, and a new bumper. We are also discussing the possibility of a raising platform to make better use of the annex. The trailer below this point was built and sold. Read on for build notes! Last Summer while camping on the Rubicon, we camped at the base of a small ledge near Buck Island Lake. Our tent was on the ground at the base of this ledge. All night, (what I though could be potentially drunk) drivers drove their rigs around the area. The thought of one of them not seeing our tent, and attempting the ledge kept me up all night. Our campsite at BIL: On the right (ledge can’t be seen). So finding a way to get up off the ground has been on my list. In addition, the ability to have “just enough” creature comforts without having “too many” is appealing to me. Also, as trail-bound vegans, we tend to bring all our food with us, so the additional space is critical. 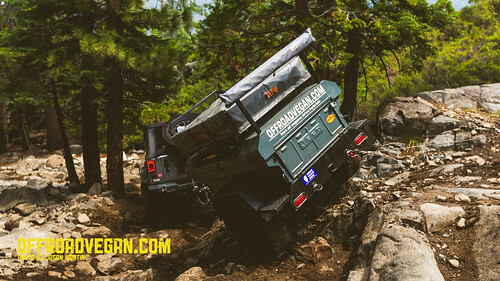 Enter the off-road trailer industry. Off-road trailers are nothing new in places like South Africa and Australia, but in the US the fledgling industry is off to a running start. This market is literally exploding with new businesses building better and better dirt-capable trailers. 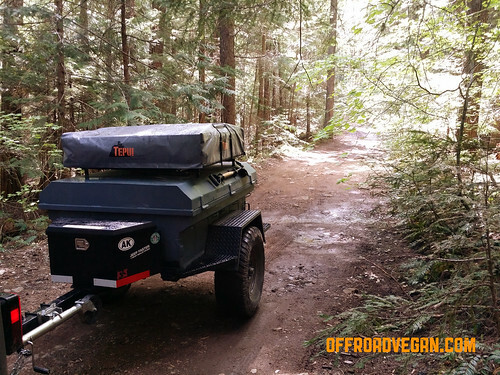 With entrants like Manley, Bivouac Trailers, and even the crazy expensive teardrops from Moby 1, the spectrum of available options is incredibly wide. The only limit is your wallet. I decided to forego the expensive shipping costs and also wanted to learn a thing or two. So I decided pretty early on to build my own. 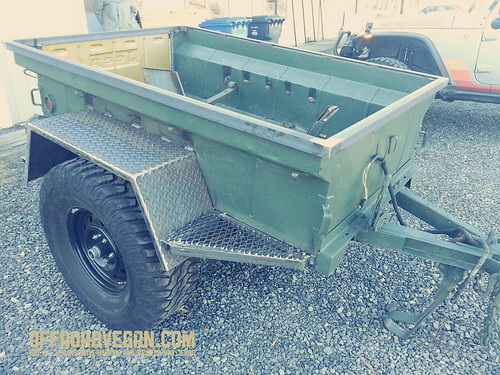 Finding an original US Army M416 trailer is no small feat. These litter farms and scrap yards around the country, but many are in rough shape and require a lot of work – more than I can do. But in October 2013 I found an ad on Craigslist of an M416 in McMinnville. I took delivery of a 1966 M416 on 10/29/13 and brought it home. Day 1: Bringing it home. 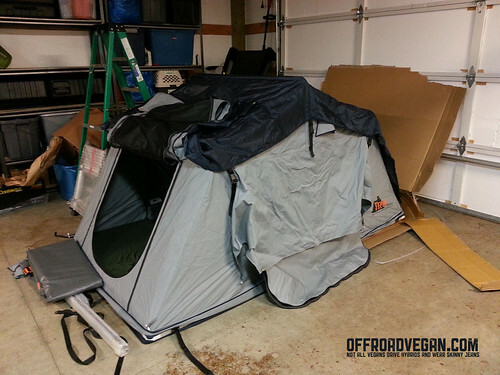 My initial build plans included the basics – bigger tires, stronger axle, a steel lid, Roof Top Tent (RTT) and a tailgate. My goal is to build a trailer that can be dragged behind the Jeep. Period. 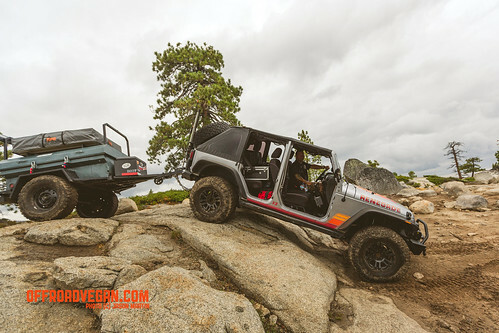 Rubicon Trail, Moab, TSF, you name it, I want this little trailer to make it through. I broke the build out into phases. I found a local trailer company that wanted to do the build. 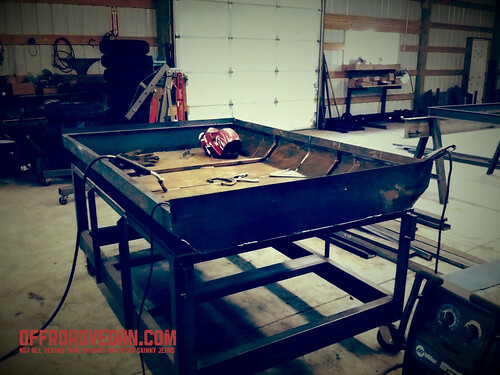 Teaming with Trail Dust Trailers, I provided the requirements and they did the fabrication. 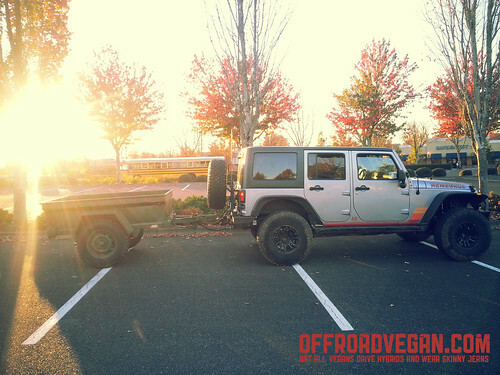 A Jeep friend also donated the original Willys tailgate, however a guy in Bend was looking to rebuild his Willys Jeep after an accident, so we traded his Jeep scripted gate for the Willys. He even included the set of hinges. Phase 2: The lid being built. Trail Dust did a great job on the build. I have a few minor things which I found during paint, and will be returning the trailer to have them addressed. When selecting a RTT, my criteria was pretty precise. I wanted something durable, a company that was relatively local, and I really wanted skylights. Envisioning sleeping under the starry sky of the Alvord Desert this Summer, I opted for the Kukenam Sky Tent from Tepui Tents in Santa Cruz, CA. Checking out the new digs: The Tepui Kukenam Sky Tent arrived! 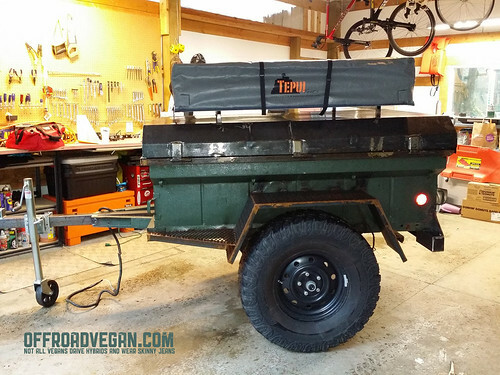 Once the trailer came back after the phase 2 build, I made sure to do a test fitment of the Tepui on the new lid. Test fitment of the RTT. 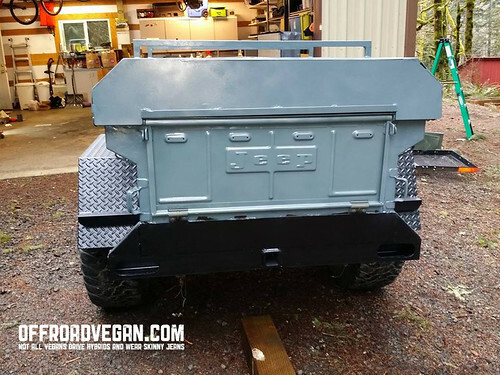 In the above image, you can see the results of phase 2 – new tongue, new lid and the rear bumper. The next step was paint. To remove the rust from the virgin steel, I applied Rust Mort, a crazy expensive acid that stops the rust process and converts the oxide to a black oxide. Once dried, I wiped the surfaces with a damp cloth and applied primer direct to the surface. I initially chose a bronze color for the tub and lid. but the color looked more lavender than bronze (and we can’t have a lavender off road trailer). I then tested “Stainless Steel” from Rustoleum and the test area looked terrible. I finally settled on a slate grey from Valspar. My goal for the paint was something that can easily be fixed at home after trail damage or welding on new components. After a fresh coat of paint and primer. I also added a set of black lug nuts to finish the wheels. Sunday will be the first trail ride for the trailer as we conquer Barlow Trail in the mud and snow. Stay tuned for photos! UPDATE (June 14, 2014): Since the build finished, I added the tongue box (from Harbor Freight). We have since taken it on a trail trial in TSF (running all of Cedar Tree, Powerline, and part of FB5). 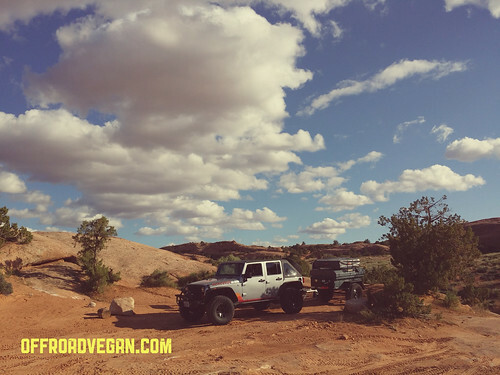 It also followed the Jeep all the way to Moab for a week of trails and camping! 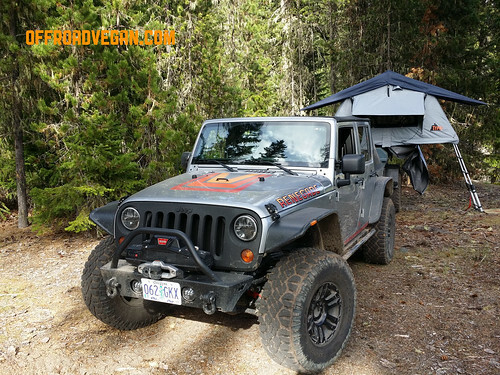 We also took it on a maiden camping voyage on the Barlow Trail. Moab, UT: May 2014. 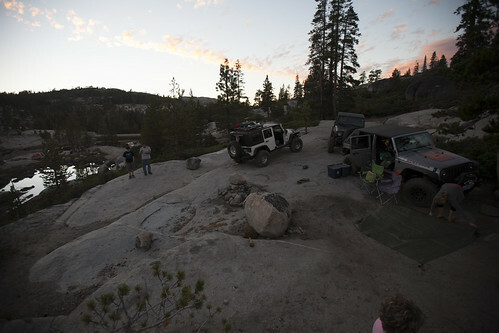 Camping off Fins N’ Things trail. Moab, UT: May 2014. Same campsite just before sunset. 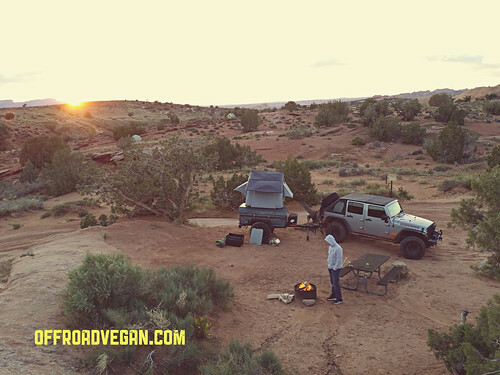 Moab, UT: May 2014. Geared up to head home in Downtown Moab. Barlow Trail, OR: June, 2014. First camping outing in Oregon. Barlow Trail, OR: June 2014. Heading out on the Barlow Road. 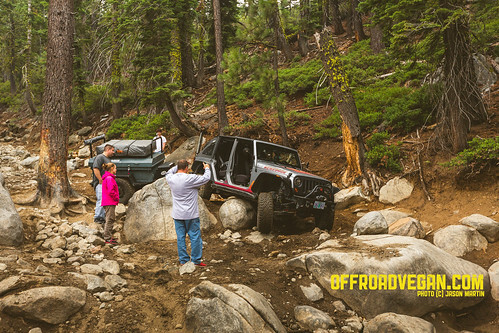 UPDATE (October 17, 2014): The trailer has successfully completed the Rubicon trail (see featured image at top)! I added more nerf steps (behind the fenders) and also added a small platform on the tongue for a step. This winter I plan to start adding electronics (Batteries, LED lights, water pump, etc). 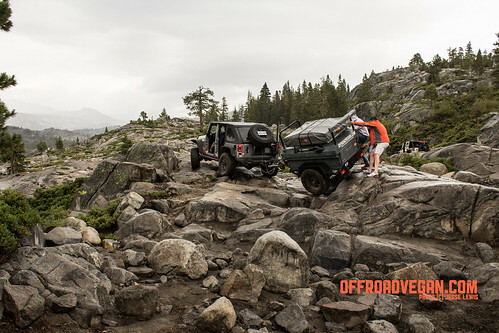 Here are more shots from the Rubicon! Be sure to read my writeups from this epic trip! The technology used in this protective coating has been developed to provide a level of finish which is rarely used in a canvas product. 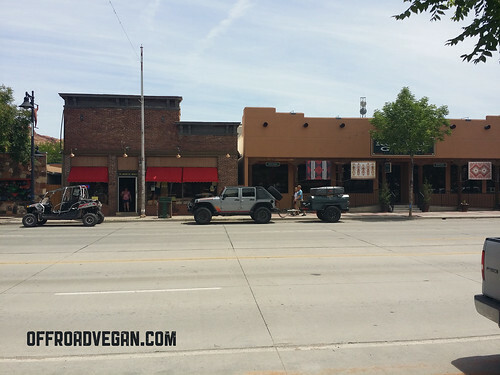 This is the typical type of an off road expedition to maintain its well-deformed building.